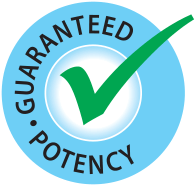 More Potency in Every Probiotic Serving: Support digestive health with 50 billion live cultures in each daily dose-GUARANTEED! 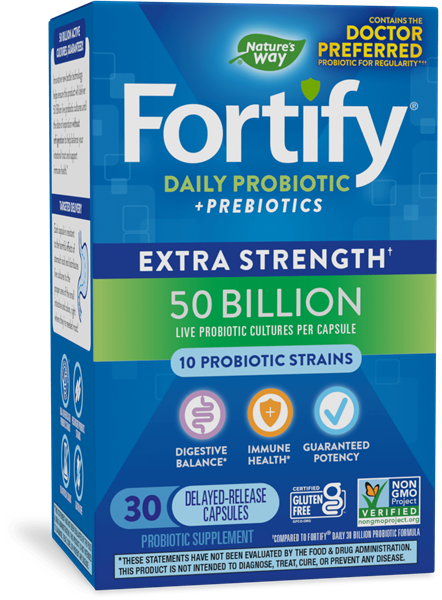 Be 50 billion strong every day with extra strength† Fortify™ Daily Probiotic. It's a powerful dose of good bacteria that includes researched probiotic strains. Take 1 capsule daily. May be taken at any time, with or without food. If you are pregnant, nursing, or taking any medications, consult a healthcare professional before use. * Percent Daily Values are based on 2000 calorie diet. Contains no gluten, artificial coloring. Potency of live cultures measured in Colony Forming Units (CFU). NCFM®, Bl-04® and Bi-07® are trademarks of DuPont. In the USA, NCFM® is a trademark of the North Carolina Agricultural Foundation, Inc. NCFM®, Bl-04® and Bi-07® are used under license. Sign up for emails to get the scoop on new products, special promotions and more. **Extra strength compared to Primadophilus Fortify 30 billion probiotic formulas. ©2019 Nature's Way Brands, LLC. All Rights Reserved.